Apple responded to the location logging stuff with a Q&A aimed at dispelling some of they myths all the hype has created. The only problem is, they try to dispel some of the facts too. The tables "CellLocationHarvest" & "CellLocationLocal" store both "Speed" and "Course" entry (several others have these fields, but did not have any or valid data in them). Unless cell towers have a habit of moving about, this would appear to be logging *your speed & direction* and not just "tower data". Granted, the "CellLocation" table containing the most significant amount of data, did not have valid data in the speed fields. The table names imply different uses for e.g. we'd expect CdmaCellLocation, CellLocation & WifiLocation tables to store the info they speak about above. But the "LocationHarvest" table not only stores valid speed & course fields, it also assigns a unique "Trip ID" e.g D47CA532-84C9-40CD-8BE6-B3895837DA3C. This looks like a unique identifier based on *your* movements, not those of the cell towers. Even if this was downloading offline caches of cell towers & APs for assisted GPS, given this includes details as granular as my neighbours Wifi AP, this is still more than enough to track your actual location. We've seen large data sets with "unique anonymous" identifiers deanonymised many times. 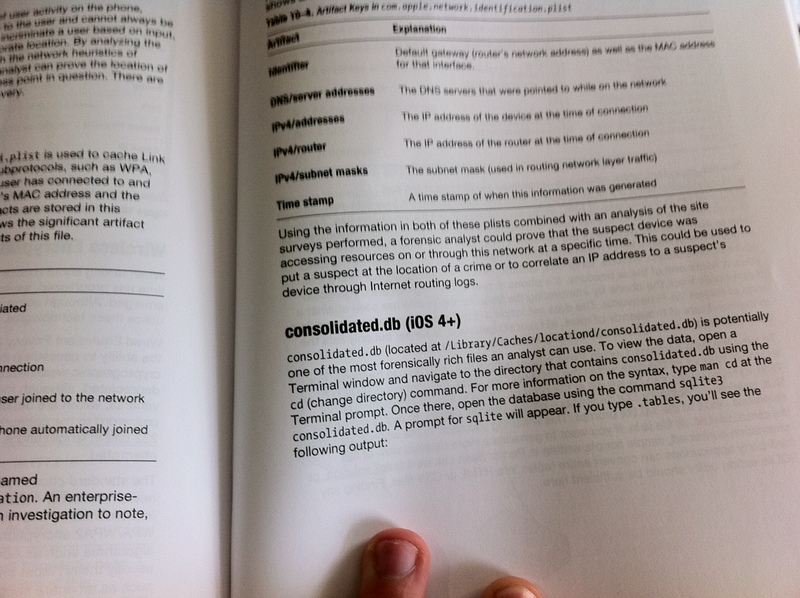 The data is good enough for forensic investigators to use, here's a screenshot from a book on iOS forensics: "consolidated.db [snip] is potentially one of the most forensically rich files an analyst can use." It strikes me that if it's good enough to use in the courts, then the implications may be a bit wider than Apple claims. And finally, further down the QA, Apple contradicts their statement of "The iPhone is not logging your location" by explaining that it is, and this will be used for traffic information. This explains the "LocationHarvest" table mentioned above. I haven't seen what is actually transmitted to Apple, so can't comment on how much is uploaded or downloaded. However, I can attest to have seen the iPhone populate the file with tower & AP information when first populating it with data (123 cell towers, and 401 wifi APs). So that part is at least true. In conclusion, I certainly don't think this is a serious threat, but this file does store rich location data that can be used by anyone with access to it to disclose a significant history of your movements. Apple has attempted to play that down, but for people to who the privacy of that data may be of critical importance (think protesters in Lybia or Egypt), they should take steps to protect themselves. Finally, it is also my belief, that based on the data in the file, if Apple has access to the same data, then there is enough information for them to uniquely identify both you, and your location history. They claim they aren't, but it just takes one breach for all of this data to end up somewhere we need to make different assumptions about, and I'd prefer that the location data Apple (and others, like my mobile service provider) collected without my consent, be deleted.